For specialty kitchen remodeling with a focus on high-end design, choose the innovative insight of Marcela Montoya Remodeling today. Unquestionably, our kitchen designs in Ft. Lauderdale are of the highest quality, thanks to our dedicated, talented team of specialists who have many years of experience in providing top-notch inspiration. We get it: you spend a lot of your time in the kitchen preparing food, cooking, baking, eating and entertaining. As such, the kitchen remodeling in your home should reflect that. Your kitchen should flow smoothly, feature all the storage you need, and give you plenty of space in which to work. 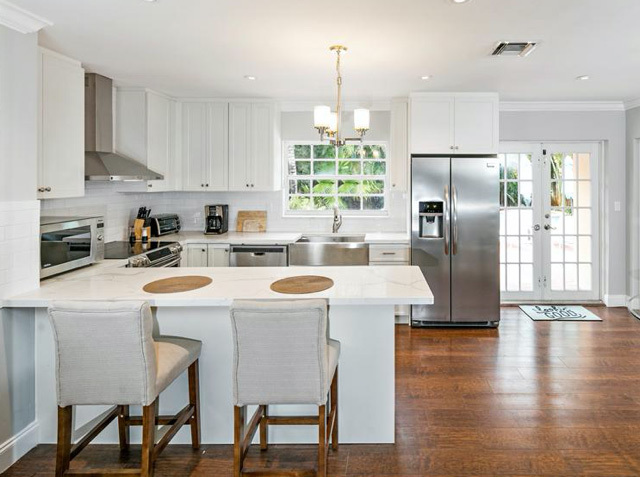 Whether you’re looking for a cozy nook or a spacious open floor plan, kitchen designs in Ft. Lauderdale should encompass aesthetics as well as flow. Here at Marcela Montoya Remodeling, we are experts at making sure your kitchen gels with your lifestyle so you can move around easily. As part of our process, we will meet with you to come up with a detailed plan for your new kitchen. After all, the design has to work for you and your family! Because we truly care about the process and outcome, you can bet we collaborate with you every step of the way from start to finish. Our specialty kitchen remodeling in Boca Raton focuses on high-end design, interior renovations and tile work. Our goal is to make your kitchen more enjoyable, comfortable and functional! For beautiful and innovative kitchen renovations in Ft. Lauderdale and Boca Raton, please contact Marcela Montoya Remodeling at 954.900.9992.